Darkthrone, ‘Brexit’ and Donald Trump: Was 2016 the Year of the Birth of ‘Homo conservativus hystericus’? Recalling the past twelve months of 2016, trying to tell it as a history of an end-of-year review is not an easy task. 2016, as a remarkable year in recent history, globally, had in petto some tough ‘surprises’: first, here we can think of the ‘Brexit’-vote in Great Britain in June; then the election of Donald Trump for president in the USA in November. Always, it is very difficult to ‘judge’ historical events that still are very close to the present. Yet, I think there are certain cutural aspects and trends making the year of 2016 a remarkable one. In this post, to be seen as a cultural historian’s end-of-the-year review in Metal Music Studies, I will try to highlight these trends and discuss their possible discursive meaning. To do so, I will start by discussing the cultural history of these two political events, the ‘Brexit’-vote and the election of Trump, then going on by contextualizing it with very similar discursive patterns in Metal Music discourse. Seeing those discourses together, should allow us to make sense of 2016 cultural-historically – at least for the moment. On 23 June 2016, British voters decided, by 51.9% to 48.1%, to make the ‘Brexit’ become political reality. This historical event was new and different, therefore, a shock in several ways: (1) It was the first time a country decided to leave the European Union. (2) It was one of the first times that a political campaign, inspired by populism, harsh emotions, nationalism and conservatism, led to a big political success, sealing the further way of a whole country or nation. (3) It was one of the first events in which, on a macro-level of cultural discourses, the cultural trend called ‘postfactualism’ gave a highly important political process its central cultural features. Taking these three points together, we can call this event of June 23 one in which the cultural discourse of conservativist populism became successful, politically. One central thing was really new about this discourse: it was not ‘common’ conservatism but conservatism that substituted its rational core in narrative by an emotional stream of passion. In Nigel Farage’s discourse, conservatism of a nationalist kind was painted in the colors of xenophobia, national pride, fear of the ‘other’ and guilt. In short: it was the real debut of ’emotional conservativism’ in Great Britain. Its structure as a historical event is to be found in the linkage of common conservativist topics and emotional language. On 14 October 2016, Norwegian Black Metal-veterans Darkthrone released their new album ‘Arctic Thunder’. When Darkthrone, as an artistic collective consisting mostly of guitarist/vocalist Ted ‘Nocturno Culto’ Skjellum and drummer Gylve ‘Fenriz’ Nagell, started out to establish Black Metal in the early 1990s, this discourse was fresh, rebellious, ‘dangerous’ and new. But, that was more than twenty years ago. Meanwhile, Darkthrone are still releasing albums on a regular base but their music is not pure Black Metal anymore. It is a hybrid form of Rock’n’Roll, Crust Punk , Heavy and Black Metal. The music on the records is not an essential change but the aesthetics hark back to the band’s own history. The cover shows a campfire in the night, dark woods, the band’s classic logo and the record’s title. This composition, as a discursive move, takes up classical Black Metal aesthetics which Darkthrone were famous for in the 1990s. Dark forests, night, campfire are key symbol in this discourse’s conservative aesthetics. 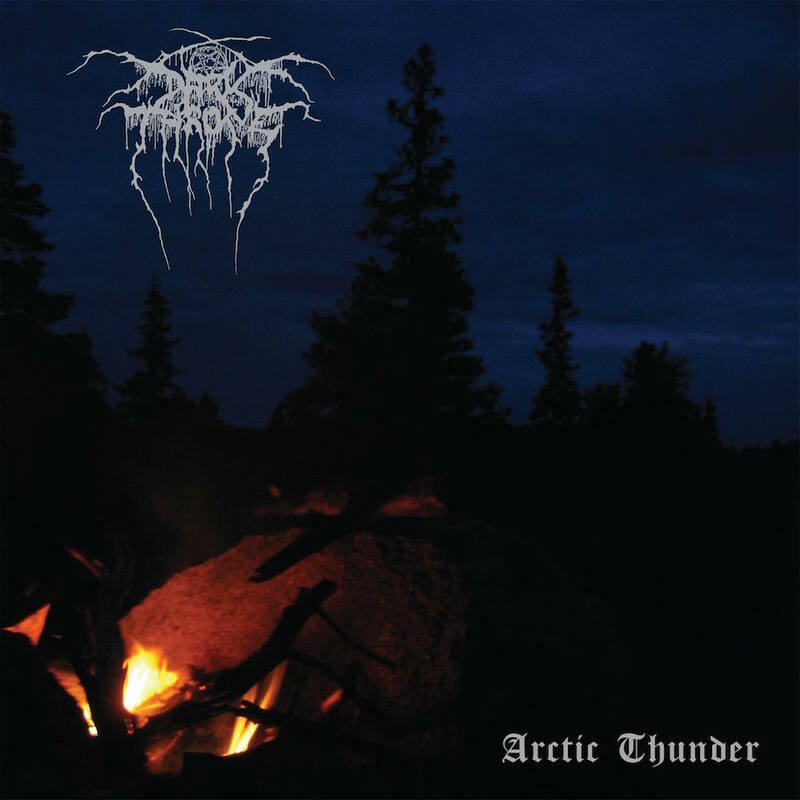 However, there is one central difference between 2016’s Darkthrone cover and the ones from the 1990s: they feature the very same symbolism but ‘Arctic Thunder’ is pictured in colour while the old ones were black and white. On 8 November 2016, Donald J. Trump, American businessman and television star, was voted to become the United States’ 45th president. This was a political event, not predicted by mainstream media and discourses, which was called upon ‘historical’ from the very first minute. A former businessman and ‘celebrity’ who cultivated a highly emotional discourse of populism, taking up narratives of xenophobia, nationalism, misogynism, sometimes even racism, was elected to become president. His opponent, Hillary Clinton, predicted to become president, lost the battle. I do not want to join the global debates on that event, being shocked or delighted, pleading for political ‘revenge’ on the ‘establishment’, but to examine this event’s discursive structure. At its core, Trump’s political campaign and discourse was highly conservative, often right-wing, being embedded in the traditional Republican Party’s programme. Yet, this discourse had, on its surface, a very different appearance: it was aggressive, passionate, always full of emotions. Trump’s election is yet another example of the linkage of conservative thought and emotional language in 2016. The birth of ‘Homo conservativus hystericus’? Recalling this three very different historical events of 2016, the ‘Brexit’-vote in June, the release of Darkthrone’s ‘Arctic Thunder’ in October and the American presidential elections in November, two political decisions and one artistic speech act, they feature the same structural characteristics. They are conservative ‘to the bone’ but on the surface, concerning language and symbolism, their discourse is emotional, aggressive fresh and passionate. All three of them are ’emotional conservativism’. So, when summarizing my thoughts in this post, the year of 2016 seems to be indeed a remarkable one. Recently, cultural historian Wolfgang Schmale published a monograph2 which has the theoretical concept of ‘collective historical performative speech acts’ at its center. It theorizes identities and narratives innovatively as ‘collective performative speech acts’ (i.e. ‘Eurocentrism’, ‘European Identity’, ‘Enlightenment’) which become influential points of reference – and Schmale thinks of our recent period as a history of change towards ‘post-performativity’. We can take up this thougt for a cultural-historical end-of-year review of 2016 in Metal Music Studies. Seeing the similar structures in discourses in politics and music, too, we can think of 2016 of a year in which a new ‘collective historical performative speech act’ entered the cultural stage. Satirically, this new figure of discourse may be called ‘Homo conservativus hystericus’: he is, most of all, white and male, gains attraction by yelling emotionally; yet he sticks to his conservative roots. This entry was posted in Artikel, Fachwissenschaftliche Artikel, Populärwissenschaftliche Artikel and tagged 2016, Brexit, Conservative, Cultural History, Dakrthrone, Donald Trump, homo conservativus hystericus, Populism. Bookmark the permalink.